This is not my own recipe… But it’s now mine in the respect that I’ll be going back to this one for some time. Truth be told, there are two recipes not mine that are now mine in this post. Each with my own spin, based on what I had available at the time of preparation. Begin with a couple of leaves of red leaf lettuce, then use fresh parsley for the rest of your greens. 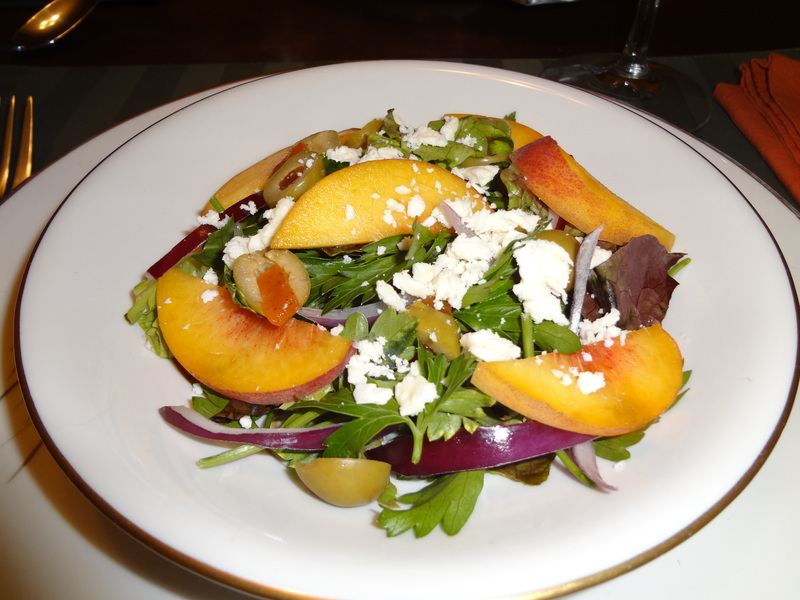 To that, I added little half-moon slices of red oinion, green olives, and thinly sliced peaches. On top I added some feta cheese. I served it with a peppery lemon vinaigrette (it sounds a lot fancier than it is), and it was delicious. There was a sale on turkey thighs at the grocery store. I am not a turkey person, never have been. But The Great Spousal Unit is most definitely a turkey person, and I wanted to do something nice. Since I had never cooked turkey before (true), I went searching on the internet for an easy, but good looking recipe. I found it here. I only deviated slightly in the ingredients. The link has the recipe and some great in-progress photos, but if you don’t want to click over there, here’s the recipe, with the finished product below. Preheat oven to 400°F. Let turkey thighs sit at room temperature for about 30 minutes before cooking. Gather a few leaves from each herb sprig and finely chop to make about 2 teaspoons each. Rub chopped herbs onto each side of the turkey thighs along with a sprinkle of salt and pepper. Place thighs skin side down in a deep roasting pan. Bake for about 30 minutes. 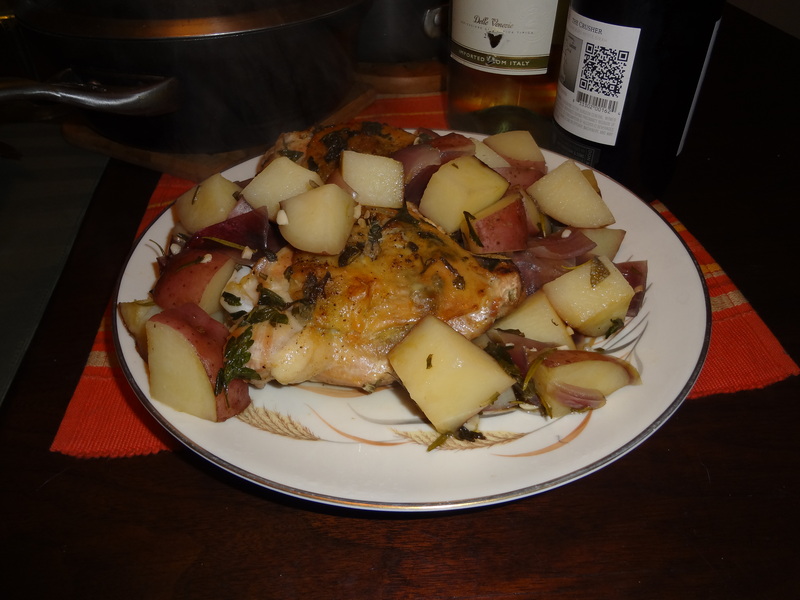 Turn thighs over, then add potatoes, pearl onions, garlic, bay leaves and herb sprigs. Pour in broth and sprinkle all with a little more salt & pepper, then drizzle some olive oil on top. Roast for another 30-40 minutes, until thighs are done and potatoes are tender. Stir the potatoes once during roasting. Remove pan from oven, let thighs and potatoes sit covered with foil for about 20 minutes before serving. Place turkey and vegetables on a serving platter. Believe me, this tasted as good as it looks. If you luck into a sale like I did, this is a super autumn meal, even if you ditch the potatoes and just go for the salad and turkey. « October DSMA Blog Carnival. What would you say? I’m not a fan of dark meat, but I would definitely try this recipe with turkey breast. It sounds really delicious. (I guess I’d probably baste it while cooking to try and keep it from being too dry – which is the curse of white meat.) And I love that you make recipes that are not yours into recipes that are yours. I guess I’ll do the same by switching up the dark meat for white meat!